Something non-specific this time, to mark the crossing of the half way point in the collectible list. 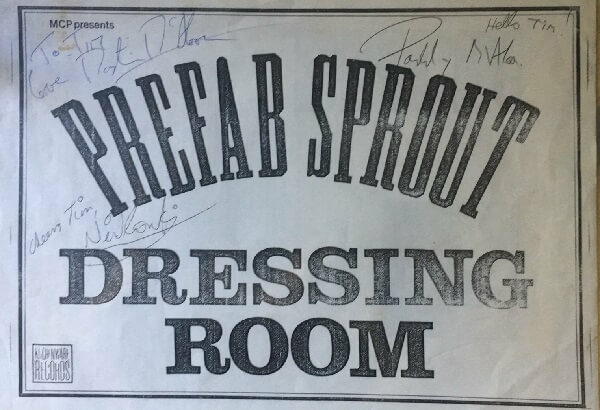 The must-have item in any Prefab Sprout collection is a Paddy McAloon signed something. Finding these is largely a question of keeping your eyes open and being persistent. You can hang about on Ebay a lot and grab something when it comes up (every few months). 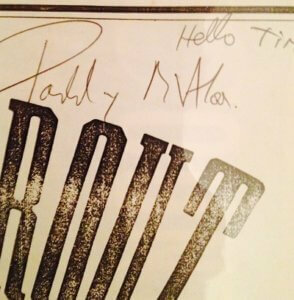 You can attempt to get something signed in person, which does happen: some fans were able to meet Paddy at the BBC during the round of interviews in January 2019 for example. Another way is to search Google frequently for offline auctions or dealers (beware of fakes though, there are some dubious examples about). Or you might just strike lucky at a record fair. Signed items were one of the things I used to hoover up on Ebay (sorry) when no-one else was interested, so I now have a fair number of them. A few are pictured here. However you’re no longer in competition with me, unless something is particularly interesting for some reason. Incidentally, my advice to sellers is to put signed items on Ebay with a 10 day auction and promote the living bejesus out of them on Twitter and Facebook – I’ll usually list here if I notice them. I’ve paid literally pennies (signed 38 carat collection CD from Japan on a Chinese auction site) up to quite a lot (signed Candle “Lions”), but a fair value is £30 to £60 depending on the desirability of the underlying item. For example, “Steve McQueen” is worth a lot more than “The Gunmsn”, and so on. There are loads of signed “Langleys” (including quite a batch of white label promos that I guess were a competition prize or something), unsurprisingly given the in-store signings at the time. 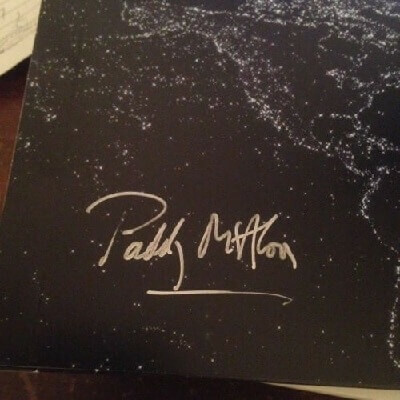 A US copy of “Let’s Change the World With Music” with nice silver autograph. 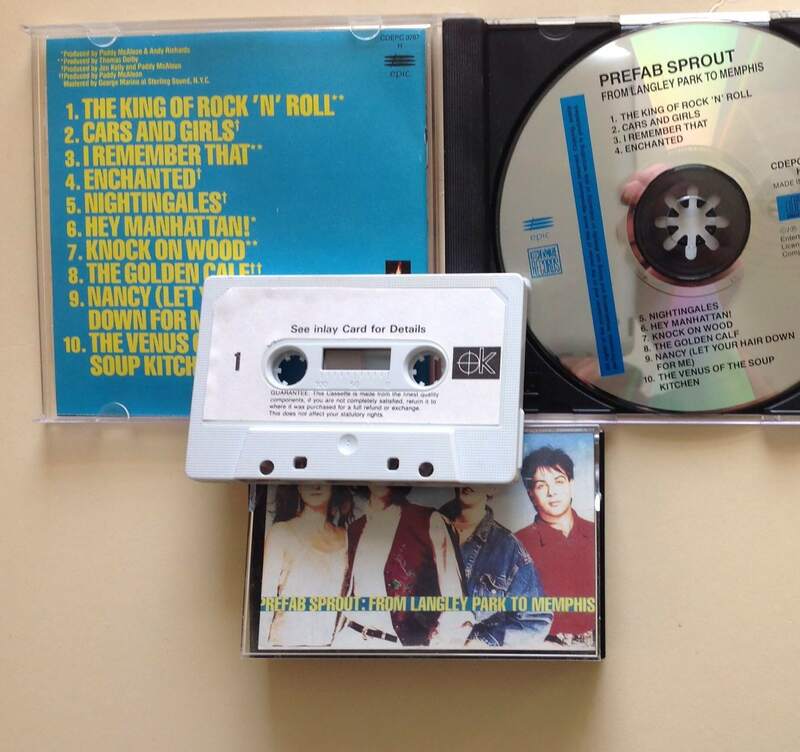 These were probably supplied as promo items but not used, as the seller had several. Classic “Langley”. They all signed their own legs. These frame up beautifully. 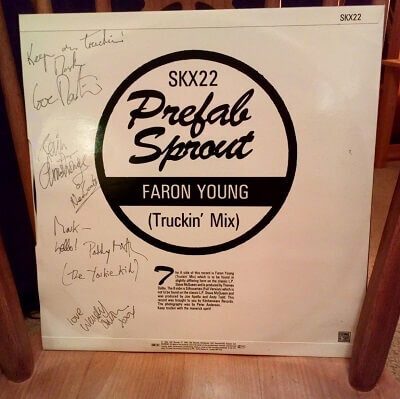 Signed singles are surprisingly hard to find. Not one I bought, but lovely. A page from the Terry Wogan guest book. 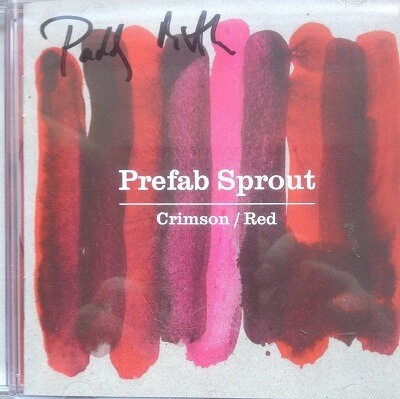 Signed Crimson/Red. 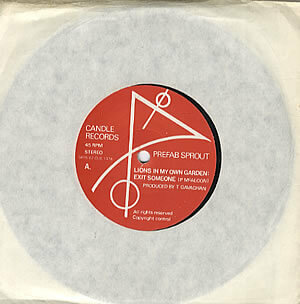 Not many of these about, Paddy distributed a few in local record shops. 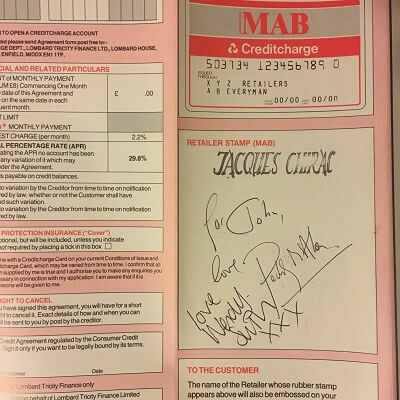 One of my absolute favourites – someone met Paddy in a shop and got him to sign the only thing available, which was a store card application form. Christmas card, signed by the band, including Michael Graves. Cassettes don’t get signed as much as albums. This is an exception. There was a time when “I Trawl” went for pennies, and this signed copy was a few quid. 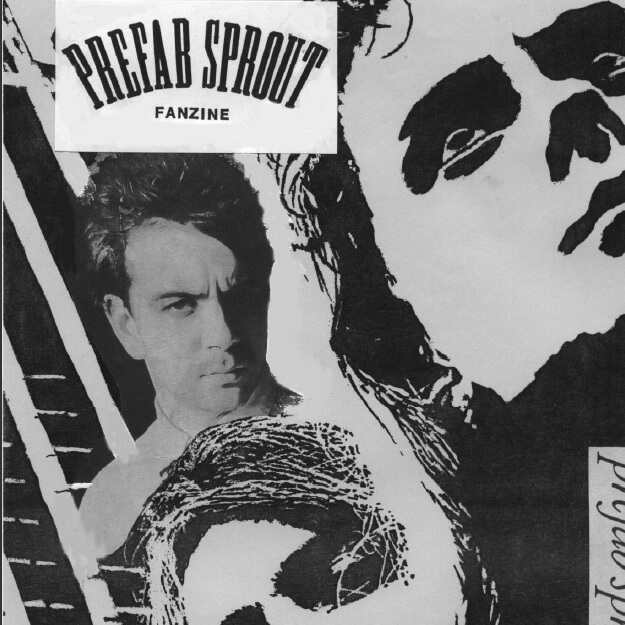 The seller got this at the original press launch, and sold at least one more afterwards,which stupidly I didn’t buy. Happy days. 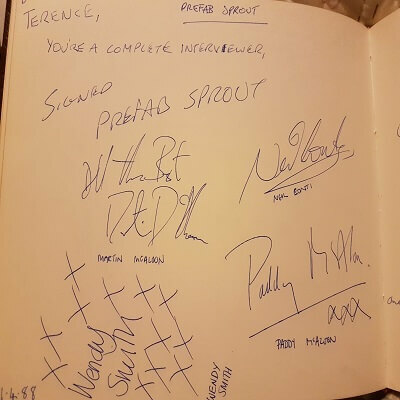 No, not signed to me -he only time I met real Sprouts – Wendy and Martin – I didn’t dare ask. But this signed stage door sign from Sheffield is the closest I have and a bit of a treasure. 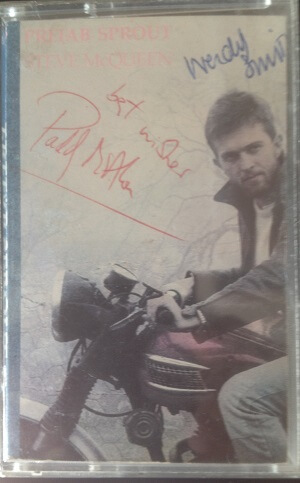 I remember being frustrated missing out on the signed box sets of Crimson Red. I bought the unsigned version. On a visit to Windows in Newcastle, Paddy’s shop of choice for music (? ), I picked up the signed cd in the racks. At the till I enquired if there were any signed lp’s? The extremely kind assistant had a copy put aside for himself, which he let me have. 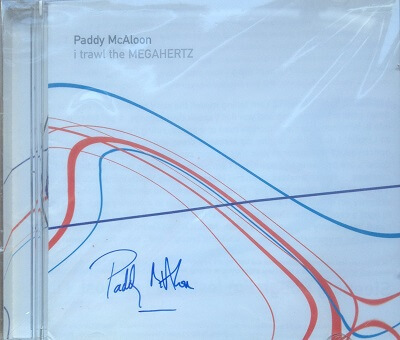 Paddy visits often and he was hoping to get another copy signed for himself. I hope he got it. 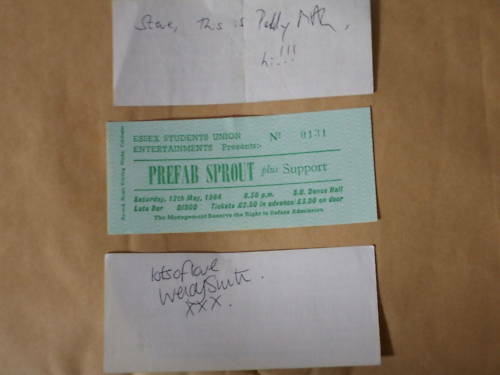 So I went from no signed Prefab Sprout items to two in one fortunate afternoon. Hi. A very dear friend is retiring soon and a huge Paddy and Prefab fan. If you hear of any signed items for sale please let me know, she would love something and I am not getting much luck.